Kakapo….A Parrot As Big As A Small Dog….Really? The ancient, flightless Kakapo is the world’s rarest and strangest parrot. It the only flightless and nocturnal parrot, as well as being the heaviest in the world, weighing up to 3.5 kilograms (8 lbs). The birds live in New Zealand, an island country which had virtually no mammals living on it for millions of years. It was a place inhabited by birds and reptiles. The only types of mammal were two species of bats. The Kakapo did not learn the defense mechanisms to combat or escape mammalian predators. This made the parrot very vulnerable when new animals started showing up. 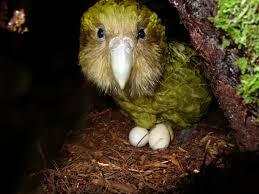 The arrival of Polynesian peoples thousands of years ago, of Europeans in the 1800’s, and ultimately the pets and livestock they brought with them resulted in the massive decline of Kakapo populations from hundreds of thousands to a mere handful of birds. Once common throughout the three main islands of New Zealand, there are now approximately 62 Kakapo left. . These remaining birds have been relocated to six predator free island habitats, where the birds are relatively safe and have been breeding!